Crazy Stereo is authorized dealer for all top of the line major name brands. It is very important to purchase your product from an authorized retailer. Regardless of any claims made by the seller, you will not receive any warranty from the manufacturer. Manufacturers will not offer any technical support to customers who purchase from non-authorized dealers. Products purchased from non-authorized dealer might be damaged or compromised in many ways. Many unscrupulous retailers attempt to remove factory serial numbers in order to avoid detection. In the process, the product's ability to reliably reproduce sound is often destroyed. Purchasing from non-authorized dealer compromises YOU and your investment; consumers have no way of determining whether these products are used, refurbished, counterfeit, stolen or otherwise compromised. By purchasing from a non-authorized dealer you may expose yourself to be improperly informed/advised about the product. Authorized dealers are trained extensively by manufacturers to answer all technical questions and provide you with accurate information. Many non-authorized retailers will offer products not designed for the US market. That means your radio may not be able to receive US stations or your DVD player may not play your movies. ?I get calls about customers who bought units from unauthorized dealers and the serial number has been ground off, removed or altered. Sometimes a customer is upset that Alpine will not repair a product. In fact, if the customer sends it to Alpine they won't fix or return it, but give it to the Police as it's against California Law to be in possession of such products.? USA SPEC reserves the right to offer technical support and warranty only on products purchased through Authorized USA SPEC dealers. USA SPEC will NOT provide technical support on purchases made through any unauthorized Internet seller. We strongly recommend only buying from sellers who provide dedicated phone contact support. USA SPEC sells its products through authorized accounts so we can insure customers can receive the best possible service. PAC will NOT honor or support any warranty claims for purchases made on eBAY. Regardless of what they might tell you in the auction, PAC does not approve of ANY eBAY seller for our products. 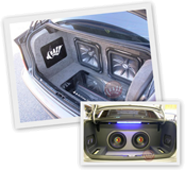 Only authorized Rockford Fosgate dealers are factory trained to sell and install our products. They know our products and your vehicle to insure that your new purchase exceeds your expectations! Rockford Fosgate provides one of the best warranties in the business. Only customers purchasing through authorized dealers receive this comprehensive factory warranty. Unfortunately, counterfeit Rockford Fosgate products exist. The only way to be certain you're getting the ?real deal? is to buy through authorized Rockford Fosgate dealers. We're picky about service. It's why we insist on doing the repairs ourselves, with original parts, at the factory where they?re built. We do it right the first time and we do it fast. Only products purchased through authorized dealers get it. Protect yourself and your investment by making sure that the dealer is part of the Rockford Fosgate family. Boston Acoustics Mobile Audio products are sold worldwide only by authorized dealers. Our carefully selected dealers are fully trained to demonstrate and service all of our products. In addition, Boston Acoustics provides a manufacturers warranty to all Boston products sold by authorized dealers. Boston Acoustics does not authorize mail order or online sale of its products except for authorized Boston Mobile Audio Internet Partners. There are some dealers who resell our products that are not authorized to do so. Some of these dealers run advertisements in the back of magazines or sell online via the Internet. The goods they sell are, in most cases, acquired via unauthorized practices. Often these goods are damaged, defective, or used. Most unauthorized dealers do not offer any service after the sale. Also, some of these dealers change their name and location to avoid responsibility for any problems, which may have occurred after the sale. Products sold by an unauthorized dealer are not entitled to Boston's warranty. Boston Acoustics is actively pursuing unauthorized dealers to stop them from selling our products. Since 1979, we have provided our customers with high-quality products at the best possible prices. We have gained much of our reputation as an established audio systems manufacturer simply by not allowing anything but the highest quality products to leave our factory doors. Also, we want you to receive the best possible service during and after the sale. Only an authorized Boston dealer or manufacturer can give you the personalized service you deserve. To ensure that you are dealing with an authorized Boston Mobile Audio dealer please visit our Dealers Web page. What are the legal consequences if you buy products with altered serial/defaced/scratched serial numbers? 537e. (a) Any person who knowingly buys, sells, receives, disposes of, conceals, or has in his or her possession any personal property from which the manufacturer's serial number, identification number, electronic serial number, or any other distinguishing number or identification mark has been removed, defaced, covered, altered, or destroyed, is guilty of a public offense, punishable as follows: (1) If the value of the property does not exceed four hundred dollars ($400), by imprisonment in a county jail not exceeding six months. (2) If the value of the property exceeds four hundred dollars ($400), by imprisonment in a county jail not exceeding one year. (3) If the property is an integrated computer chip or panel of a value of four hundred dollars ($400) or more, by imprisonment in the state prison for 16 months, or 2 or 3 years or by imprisonment in a county jail not exceeding one year. For purposes of this subdivision, "personal property" includes, but is not limited to, the following: (1) Any television, radio, recorder, phonograph, telephone, piano, or any other musical instrument or sound equipment. (2) Any washing machine, sewing machine, vacuum cleaner, or other household appliance or furnishings. (3) Any typewriter, adding machine, dictaphone, or any other office equipment or furnishings. (4) Any computer, printed circuit, integrated chip or panel, or other part of a computer. (5) Any tool or similar device, including any technical or scientific equipment. (6) Any bicycle, exercise equipment, or any other entertainment or recreational equipment. (7) Any electrical or mechanical equipment, contrivance, material, or piece of apparatus or equipment. (8) Any clock, watch, watch case, or watch movement. (9) Any vehicle or vessel, or any component part thereof. (b) When property described in subdivision (a) comes into the custody of a peace officer it shall become subject to the provision of Chapter 12 (commencing with Section 1407) of Title 10 of Part 2, relating to the disposal of stolen or embezzled property. Property subject to this section shall be considered stolen or embezzled property for the purposes of that chapter, and prior to being disposed of, shall have an identification mark imbedded or engraved in, or permanently affixed to it. (c) This section does not apply to those cases or instances where any of the changes or alterations enumerated in subdivision (a) have been customarily made or done as an established practice in the ordinary and regular conduct of business, by the original manufacturer, or by his or her duly appointed direct representative, or under specific authorization from the original manufacturer.